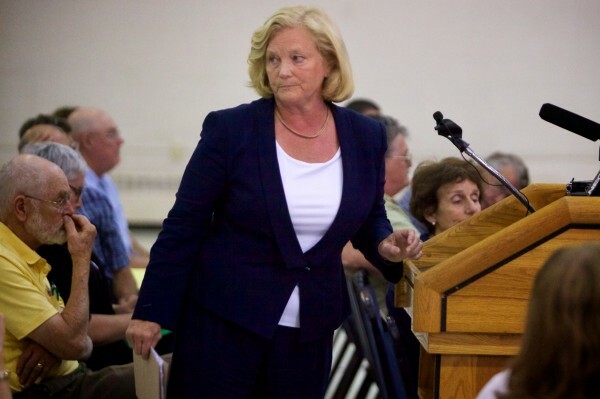 U.S. Rep. Chellie Pingree, D-Maine, leaves the podium after speaking to the Maine Department of Agriculture, Conservation and Forestry, listens in Augusta Monday. Pingree spoke of her concerns with proposed regulation on produce farmers and processing facilities. 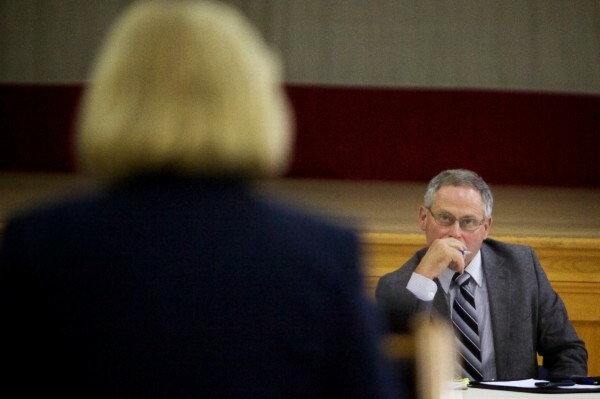 U.S. Rep. Chellie Pingree, D-Maine, speaks while Walter Whitcomb, commissioner of Maine Department of Agriculture, Conservation an Forestry, listens in Augusta Monday. Pingree spoke of her concerns with proposed regulation on produce farmers and processing facilities. AUGUSTA, Maine — Proposed regulations for fruit and vegetable producers would cripple Maine’s small farms and cause many to close, according to farmers speaking Monday to federal officials from the U.S. Food and Drug Administration. Farmers called the rules, proposed as part of the Food Safety Modernization Act, a “game-changing piece of legislation,” compliance with which would be so costly that many of them would have no choice but to stop growing food altogether. Officials including Michael Taylor, the FDA’s deputy commissioner for food safety, hosted the question-and-answer session at the Augusta Armory, where they presented two proposed rules, one for farmers who grow fruits and vegetables, and another for facilities that process food. The revised food safety act, signed into law by President Barack Obama in January 2011, is meant to create an integrated system of regulations designed to reduce foodborne illness before it happens, rather than forcing federal officials to react to contamination crises as they occur. Dr. Samir Assar, director of produce safety at the FDA, said the proposed rules would prevent 1.75 million acute illnesses every year, saving $1 billion per year in costs associated with containing and treating foodborne illnesses. U.S. Rep. Chellie Pingree, who owns a small farm and restaurant on the island of North Haven, told the FDA that the distinction between “farm” and “facility” is too complicated, and that many farms in Maine may end up being covered by both sets of rules — something Congress did not intend when it passed the act, she said. Pingree said the rules as currently proposed constitute an “overreach” of the FDA, and pressed officials to come up with solutions that better address the realities of small, diversified farms in Maine. Maine has been a hotbed for the local food movement. The average age of farmers has gone down while the number of farms under cultivation has gone up. Farmers markets pop up weekly or even twice-weekly in many communities. Meanwhile, so-called “local food sovereignty” activists have had success proposing — and in some cases winning — rules at the local and state level to deregulate small farms and direct-to-consumer sales. Rep. Brian Jones, D-Freedom, sits on the Legislature’s Agriculture Committee, and represents an area of Waldo County where organic and locally grown food is a given, not a novelty. He said the FDA’s proposed regulations are unnecessary in Maine. The produce safety rules would apply to foods that are usually consumed raw and not sent to processing facilities that include a “kill-step” that would eliminate any potential contaminants. The rules establish standards for worker food safety training, agricultural irrigation and water use, the use of compost and manure, cross-contamination by domesticated and wild animals, and sanitation of equipment, tools and buildings. The facilities rules are more stringent, and apply to farms that do more than just grow and harvest food for sale, such as aggregating produce from other farms or processing food. The proposed rules exempt “very small” farms — operations with less than $500,000 in sales annually, as long as half those sales are direct-to-consumer. Another exemption would apply to farms with less than $25,000 in sales, regardless of where the produce was sold. Foods that are “rarely consumed raw,” such as potatoes and Brussels sprouts, would also be exempt. One regulation opposed by many farmers is a rule governing the use of manure or compost containing ingredients that originate in animals. The rule would require a nine-month wait between the time the manure or compost is laid and harvest. Farmers said that period is too long, and would essentially take a Maine field out of production for an entire growing season. Taylor said the rulemaking process is still in the very early stages, and that comments submitted by farmers would be considered in amendments to the proposal. He said his agency was trying hard to craft regulations that are scale-appropriate to all farming operations, big and small. The FDA will hold similar question-and-answer sessions in New Hampshire and Vermont this week, and is asking farmers to submit written comments on the rules at fda.gov/fsma.